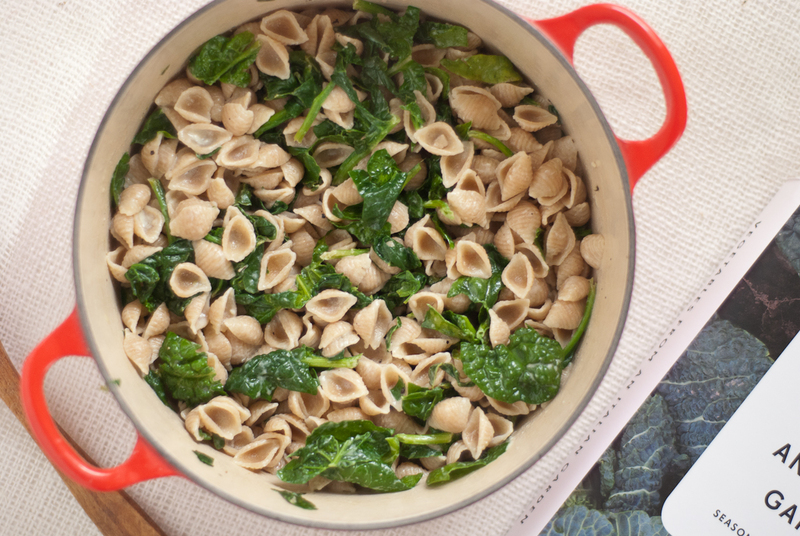 Today I present a supremely easy, light and healthy one-pot pasta dish. Start to finish, I bet you could pull this together in fifteen to twenty minutes. It’s super versatile, too. If you don’t like gorgonzola, use a different kind of cheese! Find a beautiful bunch of chard? Sub chard for the spinach! 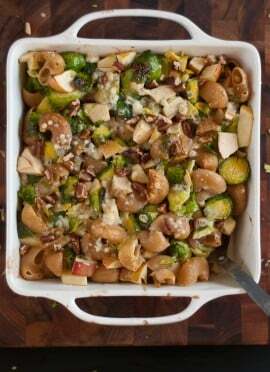 Add roasted winter vegetables or white beans! In keeping with the light and simple spirit of this dish, I’ll keep the words to a minimum. A couple of my favorite friends (and their funny mutt, Maybe) are coming to town and staying with Cookie and me this weekend. I’m so eager to shut down the computer and enjoy the company of good friends that I can hardly sit still. As with any simple dish, quality ingredients are key. 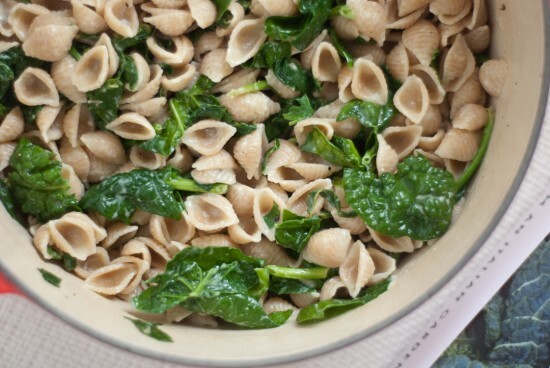 Start with whole wheat orecchiette or any small whole wheat pasta (rotini or penne may be easier to find). Seek out the freshest greens possible. 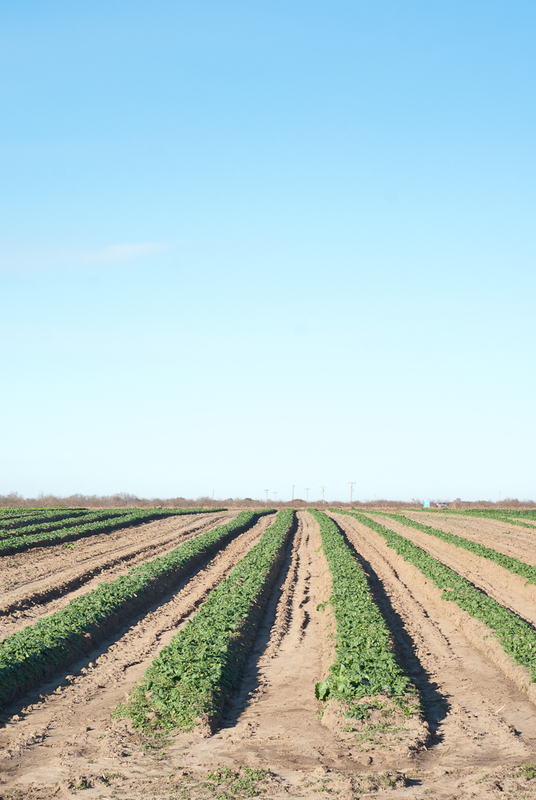 This spinach from Peach Crest Farm in Stratford, Oklahoma, puts the regular store brands to shame. The spinach is so good that Cookie literally begged for it. She kept sneaking off with spinach leaves from the table while I was taking pictures! Today’s recipe is inspired by a simple recipe I found in the spring section of Vegetables from an Italian Garden. Fortunately James from Peach Crest says he’ll be able to grow spinach all winter long, so I’ll be able to enjoy this meal from now through spring! Rather than sautéeing the spinach with shallot in olive oil, I took a shortcut that I picked up while reading Mark Bittman’s Food Matters Cookbook. 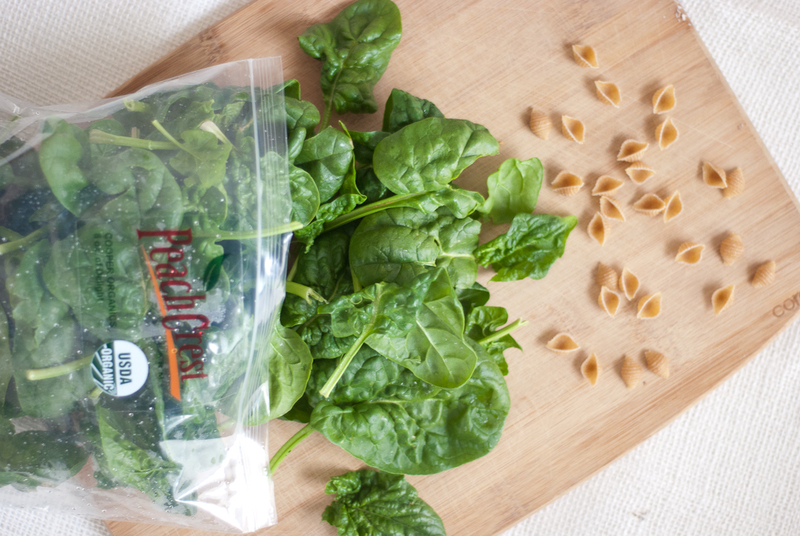 The secret to quickly steaming greens for pasta is this: once the pasta is done cooking, just throw the greens into the pot, wait a few seconds, and drain! I whipped together the gorgonzola sauce using ingredients I had on hand: crumbled gorgonzola cheese, 2% milk, and lemon. I recently encountered a gorgonzola cream sauce that used gorgonzola (duh), cream (duh), and nutmeg (delicious), so you might like to try nutmeg instead of lemon. I think goat cheese would be pretty amazing along with some chopped roasted red pepper, which is not unlike my favorite pasta salad recipe. 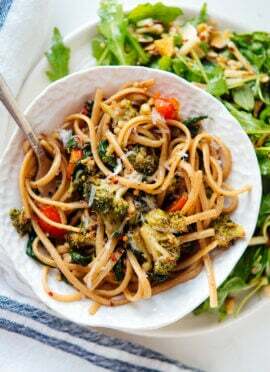 You could also go with a simple butter and garlic sauce, pasta, and steamed greens! Bring a big pot of salted water to a boil. Add your pasta and cook until al dente, according to the directions on the box. Rinse off the spinach. If desired, roughly chop your spinach into slightly smaller pieces. 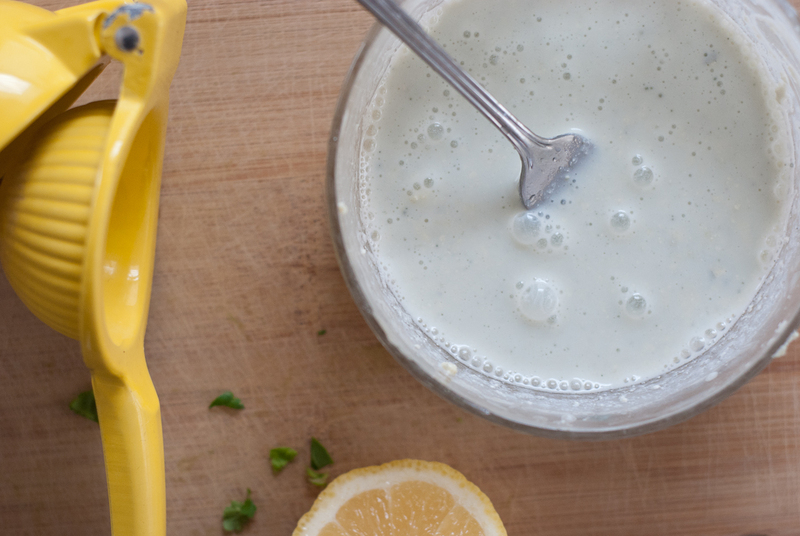 In a small bowl, mix together the milk, gorgonzola and the juice of one lemon. Once the pasta is done cooking, toss in the spinach, stir, and cook for about 10 to 15 seconds . Drain. Drizzle in the olive oil and pour in your gorgonzola sauce. Stir, and enjoy! Inspired by Vegetables from an Italian Garden: Season-by-Season Recipes. I love carbonara! But nothing beats stealing dips red sauce simmering on the stove with some crusty Italian bread. My favorite Italian dish is lasagne, I don’t make it often enough! My favorite Italian dish is linguini with clam sauce. Thank you for the introduction to a wonderful cookbook! I love eggplant Parmesan! Can’t get enough of it! Favorite italian dish: Cheesy Fettucini Alfredo! nooooooooo!!! :(( Please please come to Italy, I would love to be your guide and show you there no trace of alfredo sauce in my country. I say that with love. mine is cioppino…………very yummy and healthy ! Looks like a gorgeous cookbook! :) My favorite Italian dish is probably lasagna! What Italian dish isn’t amazing! Possibly caponatta…although I think I ate pizza, pasta, and their wonderfully simple arugla salad every day for the year I lived in Florence. LOVE cookbooks! How do you decide your favorite Italian dish when pasta is just so good? I love a healthy dose of spaghetti and meat sauce or lasagna! My favorite Italian dish is frutti di mare!! 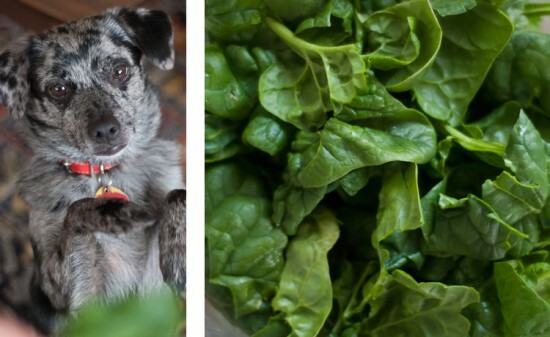 I love spinach and it’s too cute to see Cookie beg for it! I love thin crust pizzas loaded with veggies. yummy. Cookie and Kate is such a terrific veg-heavy blog. Thanks so much! My favorite Italian dish is Buffalo mozzarella drizzled with a good extra virgin olive oil, served with ripe tomatoes and fresh basil! Oh my gosh! that looks so simple yet SO delicious! My favorite simple recipe is a tomato + couscous dish. It’s so easy but so delicious! This looks great! I love a good creamy gorgonzola sauce. My favourite Italian dish? That’s a tough one. I’m a die hard pizza fan (home made, using a stone and paddle) but when I go to an Italian restaurant I almost always order gnocci. I’ve tried my hand at making it at home a few times and have had some success and a couple of epic failures! My favorite Italian dish (sooo hard to choose just one!) would be stuffed shells with fresh ricotta. There is nothing like making your own ricotta…so tasty! Ohhh my gosh fresh spinach… I swear I could sit down and eat a pound of it by myself. But, my favorite Italian food? So many good pastas so little time. Eggplant Parm will always hold a warm spot in my heart though. Oh wow, this book is high on my wish list! I love simple seasonal recipes with fresh local ingredients. My favorite Italian food would have to be risotto. I find it so flexible and comforting, but you can also dress it up with a fancy cheese or other goodie. my favorite italian dish is something i ate on the shores of positano – not necessarily a “dish” per se but it was freshly smoked buffalo mozzarella with the best tomatoes, arugula, and basil i’ve ever had. so simple and so so so unbelievably good. My favorite Italian dish right now are lasagna rolls. 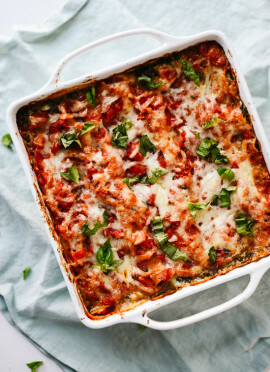 I love them because you can put anything (including lots of veggies) in them, they are easy to make, and much easier to serve than regular lasagna. I would love to win this cookbook! My favourite Italian dish is a simple insalata caprese, especially in the summer with fresh tomatoes! I love that cookie likes spinach! What a good little dog : ) My favorite Italian meal is a simple plate of fresh pasta noodles with a roasted tomato sauce. Simple, but always so good! And served with fresh bread and a green salad of coarse. simple, but oh so good… pizza margherita w lots of fresh basil! I don’t think there is anything better than spaghetti aglio e olio… spaghetti with olive oil, garlic and chili pepper… I add lemon, for an extra kick, and a sprinkle of parsley, cause it’s pretty. Such a simple but flavorful meal. Tiramisu, of course! And all the pastas ever made, of course! My favorite Italian dish is pizza – too obvious, I know! What a beautiful recipe!! I’d love to have this book, too. It sounds like it’s right up my alley. My favorite Italian dish? Completely from-scratch fettucine alfredo… fresh pasta included. I could eat my weight in that stuff. And probably double my weight. I love anything with pesto! I love everything Italian, especially pesto! This looks delicious, my favorite Italian dish is gnocchi! I would love this book; my favorite Italian recipe is pizza margareta. My favorite Italian recipe would have to be Ricotta Stuffed Shells! I love all things Italian, but would have to say my favorite recipe is eggplant parmigiana- with homemade sauce, pesto and lots of cheese! I love simple but delicious bruschetta! My favorite Italian recipe is spaghetti and meatballs. It’s easy to make and you can always adjust the recipe to your own liking. That and a stiff cocktail hits the spot. Toasted ravioli – love it! I can’t resist. My favorite Italian dish is very thin spaghetti tossed with fresh, uncooked tomatoes, basil, garlic, olive oil and Parmesan. Molto buono! Oh my, I may just make the deadline! Dying to get my hands on that book. I have been eyeing it at the bookshop for months. Veggies rule!! Hope I win :) I could eat Italian food for the rest of my life, favorites being classic like caprese. i must say that i’m not that well-known with the italian kitchen. my mum always made ‘italian’ pastas by throwing lots of different ingredients into one store-bought tomato sause when i was young. though italian food is about simplicity, about only using a few ingredients, right? anyway, would love to get to know the italian kitchen a bit more. so my favorite italian dish is one that i dont know yet (cause my moms pastas sure aren’t!). This dish looks wonderful! My favorite Italian dish is gnocchi. My boyfriend and I made it at home for the first time several years ago with the cookbook open for instructions and flour everywhere. We’ve since made it a number of times, and discovered that ricotta gnocchi is way easier than potato gnocchi. My favorite is stuffed shells with ricotta and spinach. Thanks so much for sharing this great recipe — I made it last night, and it was delicious! I added some veggie meat and red pepper flakes, which I thought were great additions. Thanks again! That’s terrific to hear! Thank you, Nicki! I just made this recipe for the second time. The first time, I messed up horribly as I was making the cheese sauce. I don’t remember for sure, but I did something like stir in either a half cup or a WHOLE cup milk and I couldn’t get the gorgonzola strained out because it was all pretty sufficiently mixed by that point. In a moment of panic, I improvised and thought I might be able to thicken it like a bechamel sauce or something, so I poured it all into a saucepan and started to bring it to a low and slow simmer. It still wasn’t thickening too well, so I got even crazier and added a little bit of the pasta water and kept it simmering (while whisking) for a bit longer. Once it seemed a bit thicker, I decided enough was a enough and threw it over the pasta and it was delicious. I made it following the recipe above tonight, and while still very tasty, I think I actually liked my messed up version better because the sauce really stuck to the noodles, like other cream-based sauces usually do. All in all, the simmering took probably 20 minutes, which you could easily do while the pasta cooks. Insanely easy weeknight dinner–whichever way you do it! And so you go on and on telling us irrelevant stories about ‘favorite friends’ etc, making it a real drag to go through the recipe. Are you paid by the word? You could always just scroll down to the recipe next time, Herbert.